Think of a scenario where we need to support a tree format data structure. Where every node can be composed of more similar nodes, or a leaf node. For example in above scenario, at leaf level we have juniors, to whom no one report. At non-leaf level we have managers, to whom, juniors and other managers report, and these managers themselves report to some senior manager. 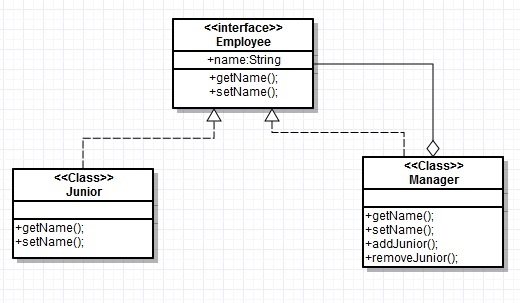 To help us structure this kind of complex relationship, composite design pattern comes into play. This entry was posted in Design Patterns and tagged Design Patterns on September 10, 2013 by admin.